Where can I find the documents related to the proposed programme budget for the biennium 2018-2019? - Ask DAG! Where can I find the documents related to the proposed programme budget for the biennium 2018-2019? The proposed programme budget for the biennium 2018-2019 will be considered by the General Assembly during its 72nd session, beginning in September 2017. 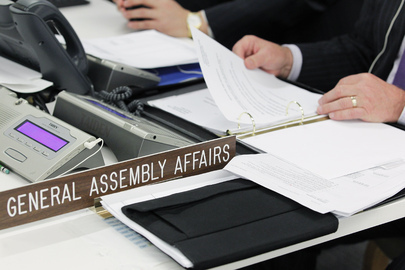 Before the 72nd session opens in September, some bodies will meet and consider the proposed programme budget and report their recommendations to the General Assembly. For example, the Committee for Programme and Coordination (CPC) meets in June. When the 72nd session opens in September, the Fifth Committee website will be an important source for information about the proposed programme budget. The website of the Advisory Committee for Administrative and Budgetary Questions (ACABQ) also has information about its consideration of the proposed programme budget. UNBISnet search results for "Proposed programme budget for the biennium 2018-2019"
Search in UN Digital Library for "Proposed programme budget for the biennium 2018-2019"
Ask DAG: What is the Committee for Programme and Coordination and how was it established? Ask DAG: What is the Advisory Committee on Administrative and Budgetary Questions and how was it established?